The basic components of sand-lime products are hydrated calcium silicates, which bind together the grains of sand. Besides them, in traditional sand-lime products some residues of unreacted sand and lime, as well as water and air in pores are also present. The amount of particulate phases has an impact on the mechanical strength of resulting products and their other properties. Stabilized compounds with a crystalline structure and dimensions up to several tens of microns are obtained thanks to the hydrothermal treatment of the components of a CaO-SiO2-H2O system at the temperature exceeding 100°C . Many years of research show that in the autoclaved sand-lime products mostly the following hydrated calcium silicates can be found: C-S-H (I), C-S-H (II), 11 Å tobermorite, xonotlite and C2SH (A) . The phase composition and properties of the products formed under hydrothermal conditions, as well as obtained from the mixtures containing components which are the CaO and SiO2 carriers strictly depend on the CaO/SiO2 ratio in the substrates and the presence of admixtures, temperature, pressure, time of autoclaving, the amount of the liquid phase, mixing method, etc. [1, 3, 4, 5]. Thanks to the modification of the sand-lime mass by introducing various types of additives and admixtures, it is possible to obtain bricks and blocks with different features. Making products lighter than standard sand-lime blocks is one of the research directions. Addition of foam glass granulate  or LDPE regranulate  are great examples. However, these additives adversely affect the compressive strength of the products. In turn, a significant strength increase was observed after adding to the sand-lime mass 20% of barium aggregate with grain size 0-2 mm [8, 9]. Introducing basalt aggregate or lithium silicate to the mass can also result in higher compressive strength of the products . All three additives contributed also to the reduction in water absorption and better compaction of the structure, which in turn has a positive effect on the acoustic properties of building materials. Other researchers describe the results of their studies on the sand-lime products modified with waste materials, such as molding sands, fly ashes or hematite tailings [2, 11, 12, 13]. There are known descriptions of the research on the use of HIPS regranulate as an additive for the autoclaved aerated concrete . At 10% of the regranulate in the sample weight, the compressive strength of the products slightly rises, but further addition of HIPS results in reduced strength. HIPS recyclate was also tested as the additive in cement mortar . A reduction in the compressive strength of 12%, 22% and 49% was obtained for mortar containing 10%, 20% and 50% HIPS, respectively. Polymer-modified mortars with recycled ABS powder also were investigated . The compressive modulus increased at 8% and 15% but decreased at 25% of ABS in the mortar. The addition of ABS powder increases the porosity of the material. Introducing to the sand-lime mass properly selected recycled plastics can improve the compressive strength of the resulting products and at the same time significantly reduce water absorption. By this method, it is possible to obtain products suitable for applications in highly loaded and exposed to moisture parts of the building, e.g. foundation walls, basement walls, etc. Since the mid-twentieth century, the global production of plastics has been systematically growing. In 2013, it reached nearly 299 million tonnes . The main segments of plastics applications include: packaging, construction and automotive industries [17,18]. These materials after some time become a waste. Despite the fact that plastics are valuable raw materials, the dominant form of plastic waste management is still landfill. One of the possible ways of their use after consumption is recycling. For the analysis of the performance of sand-lime products modified with plastic waste, polymers characterized by relatively high mechanical resistance, available in large quantities and relatively cheap have been selected. 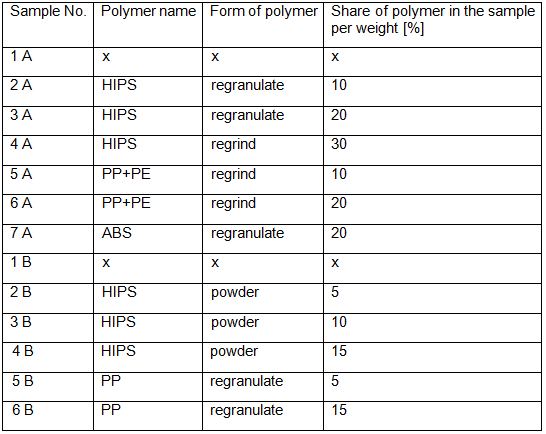 Based on a technical-economic analysis the following polymers were selected: high impact polystyrene (HIPS) in the form of regranulate, powder and regrind, acrylonitrile butadiene styrene (ABS) regranulate, a mix of regrind of polypropylene and polyethylene (PP+PE) and polypropylene (PP) regranulate. HIPS is a lightweight material with high stiffness, and it is impact and crack resistant. Polystyrene HIPS contains caoutchouc bound physically or chemically. Accordingly to the share of the caoutchouc, the physical and mechanical properties of the material vary. Products made of polystyrene HIPS are used among others to make equipment cases, elements of lighting fixtures and in the food industry to manufacture of packaging. ABS is a material with high hardness and impact resistance which has good insulating properties and is characterized by a high softening temperature. ABS is used in the production of machinery and equipment housing, interior elements of vehicles, various types of containers or elements of furniture. Polypropylene has very low water absorbency and permeability. It is characterized by low density, high corrosion resistance and relatively high surface hardness. It is a thermoplastic material, suitable for injection molding and extrusion and for the production of foils and fibers. Polypropylene products retain the shape to a temperature of 150°C. Its properties largely depend on the molecular weight, the degree of polydispersity, the tacticity and crystallinity. Polyethylene minimally absorbs moisture. It has a low density compared to other materials and high impact strength even at low temperatures. Its low weight and excellent insulation properties preferred polyethylene for use as a raw material in the manufacture of submarine cable under the English Channel. During World War II polyethylene was used for the construction of lightweight aircraft radars. Today polyethylene is a popular material used in the production of many everyday items, household products, insulation materials or foils . In order to determine the impact of the additives in the form of recyclates, specimens with dimensions of 4 x 4 x 16 cm3 were prepared. Recyclates were added to the sand-lime mass with constant lime, sand and water proportion. Next, all components were precisely mixed with a small amount of additional water and placed in steel molds. The specimens were compressed under the pressure of 20 MPa and cured in industrial autoclaves under the following conditions: saturated water steam temperature equal to 203°C and pressure equal to 1.6 MPa, total time of curing - 8 hours. The studies were performed in two series (A and B). Table 1 presents the qualitative and quantitative composition of the individual samples. The amount of each polymer was adjusted on the basis of the preliminary research, the form of recyclate and its density, which has an impact on its volume fraction in the sample and proper blending. In the first series of the study  polystyrene HIPS in the form of slightly flattened cylinders with the maximum dimension of 4 mm was used. HIPS and PP+PE regrinds were added as irregular blades with various shapes and dimensions. ABS was used in the form of irregular cylinders with dimensions up to 3 mm. HIPS powder applied in the series B had been pulverized to the grain size of 630 μm. PP regranulate were slightly flattened spheres with the diameter of around 4 mm. The results of compressive strength, bulk density and water absorption in every case significantly differ from each other. The type of used filler as well as its amount have a great impact on the properties of the resulting product. Table 2 presents the results of performed tests. where m represents the mass of dried material and V is the volume of the sample. Bulk density is a characteristic of a great practical importance. It allows to define approximately other characteristics of the material and its usefulness. Low value of bulk density is now often an advantage, since modern construction is lightweight. Low bulk density makes transport and assembly easier, reduces the load of the structure, but it may also impair its acoustic properties. The increase in bulk density is achieved by compacting the structure of the material through compression. Water absorption expresses the relative amount of water that the material can absorb and retain. It is the maximum humidity that the material can achieve. where mso,s means the mass of the sample after saturation and mdry,s is the mass of the sample after drying. Compressive strength is the maximum compressive stress that the material can sustain before crumbling. Compressive strength is the ratio of acting axially destructive compressive force to the surface size of the sample. The compressive strength test was performed using a press. Analyzing the outcomes of the tests, it is clearly visible that HIPS regranulate in an amount of 20% per weight significantly improves the compressive strength of sand-lime product. The addition of PP+PE regrind also results in a higher strength of the product. It was surprising that after using only PP (regranulate) in an amount of 15%, the compressive strength of the sample decreased (sample 6B). A gradual decrease in compressive strength of the product is observed with the higher content of HIPS powder in the sample. Introducing ABS regranulate also gives lower strength of the material. Plastics are lightweight materials, thus in each case bulk density of a modified product drops when the content of the polymer increases. This value depends also on the type of the polymer filler. The lowest water absorption value was obtained at 30% of HIPS regrind, which during hydrothermal curing partially melted down and filled the mold, constituting a mechanical barrier for water. After introducing HIPS powder in an amount of 5 and 10%, increased water absorption was observed, which was caused by the structure of the sample. Observation of traditional sand-lime products under an optical microscope showed very good connection between the components and a compact structure with a small amount of pores of not large diameters. The temperature of hydrothermal curing has contributed to change in the form of added plastics. All of them partially melted down and to some extent filled the spaces between the other ingredients. Inside the plastics in the form of rengranulates, large air voids are visible. However these fillers were well bonded with the rest of the components. In the case of regrinds (except 30% of HIPS regrind) and pulverized HIPS loose structure and many relatively large pores could be seen. HIPS powder acts as a filler hindering the proper connection between the other ingredients of sand-lime mass. Despite its small weight fraction, HIPS powder constitutes a large part of the specimen (high volume fraction) and physically blocks the reactions between lime and silica. The pulverization of the regranulate might have a major impact on the deterioration of the properties of the material. 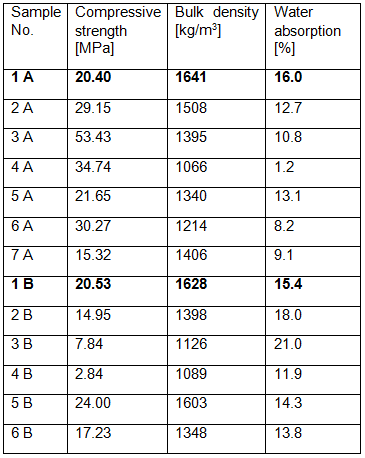 Mercury intrusion porosimetry test carried out for traditional sand-lime products  indicates a porosity of 13.89%, while 98.5% are macropores having a diameter greater than 0.05 microns and the rest are pores with diameters of 0.05-0.0036 microns. 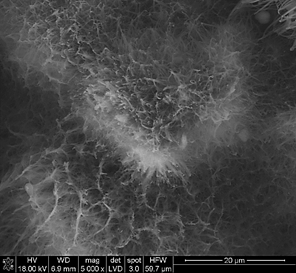 A test carried out for the sample with 5% of HIPS powder revealed, that macropores represent 84.5% of the volume of all pores, wherein 50% of the total pore volume are pores having diameters greater than 22 microns. In the case of the samples modified by the addition of 5% PP macropore volume was 75.6% and 50% of the total pore volume are pores having a diameter greater than 1.477 microns. Figure 1. XRD patterns of the sample 4A. Quartz (98-008-3849), small amount of calcite (98-015-8257) and tobermorite (98-004-0048). X-ray diffractometry of the traditional silicate revealed the presence of 91% of quartz, 5% of calcium silicate and 4% of tobermorite 11 A (by weight). 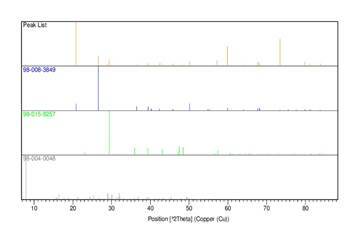 XRD analysis of samples containing HIPS indicated, besides quartz, also presence of small amount of calcite and in the case of sample 4A also tobermorite 11 A (Figure 1). In the samples with HIPS powder, the highest quantity of tobermorite was detected - around 20%. In samples 5B and 6B (PP regranulate), xonotlite was found. In other samples only quartz and organic compound were detected. In addition, there is a large amount of an amorphous substance (C-S-H) in the modified products, which does not give sharp peaks. 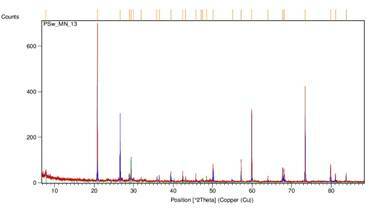 The measurements were made using a monochromatic radiation of a wavelength corresponding to the emission line K of copper in the angular range of 5-90°, scale 2. The share of individual phases was determined by Rietveld method. 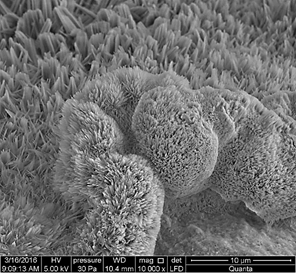 Observation of modified products under a scanning electron microscope (SEM) revealed a diverse forms of the synthesis products. 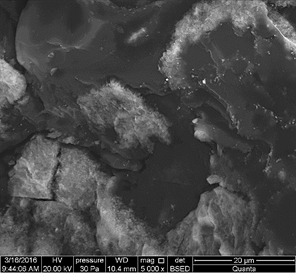 In the samples with HIPS powder fibrous tobermorite, lathlike tobermorite and amorphous C-S-H phase broken by the polymer (Figure 2) were found almost exclusively. Different forms of calcite, mostly needles and tablets, were visible. 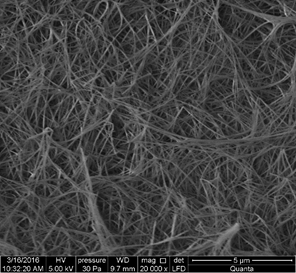 In the samples containing PP regranulate, tangled xonotlite needles (Figure 4) were found. Analysis of the samples with PP+PE regrind revealed the presence of various forms of C-S-H, including honeycomb structure (Figure 5). In all the tested samples hydrated calcium silicates in the form of needles and laths were present. Tobermorite in the sample with HIPS regranulate took the form of laths, rarely plates. Figure 2. SEM picture of sample 2B. Figure 3. Various forms of hydrated calcium silicates, sample 2B. Figure 4. Xonotlite needles in the sample 5B. Figure 5. Honeycomb structure in the sample 6A. 1) Additives in the form of recycled plastics have a significant influence on the characteristics of the resulting sand-lime products, which is dependent on the type of polymer, form of recyclate and its quantity in the sample. 2) The most preferred parameters were obtained at 20% of HIPS regranulate, 30% of HIPS regrind and 20% of PP+PE regrind, and their compressive strength in comparison to the reference sample increased by respectively: 160%, 70% and 48% and water absorption decreased by respectively: 33%, 93% and 49%. 3) The results presented above may indicate the potential usefulness of such modified products for erecting exposed to moisture and highly loaded elements of buildings, e.g. basement walls. 4) Post-consumption waste in the form of regrinds may be as valuable addition for sand-lime products as pure post-production waste, characterized by the parameters similar to those of the original polymers. 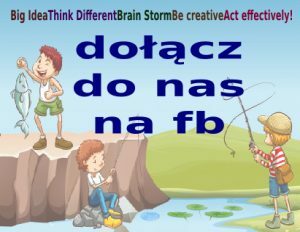 Stępień, A. & Dachowski, R. The impact of barium aggregate on the microstructure of sand-lime products, Advanced Materials Research Vols. 250-253 (2011) p 618-621.